Birkenstock’s holds true to a belief in “loving our earth, conserving our resources” and provides an entire range of original repair and maintenance services. 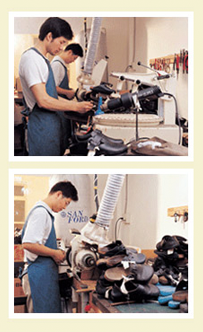 All of Birkenstock’s maintenance machinery, tools, materials, parts and accessories are all imported from Germany to ensure correct care of every pair of Birkenstocks. Periodic repair and maintenance not only keeps your Birkenstocks in top condition providing a comfortable walking experience, but also extends the longevity of the product for lasting comfort. 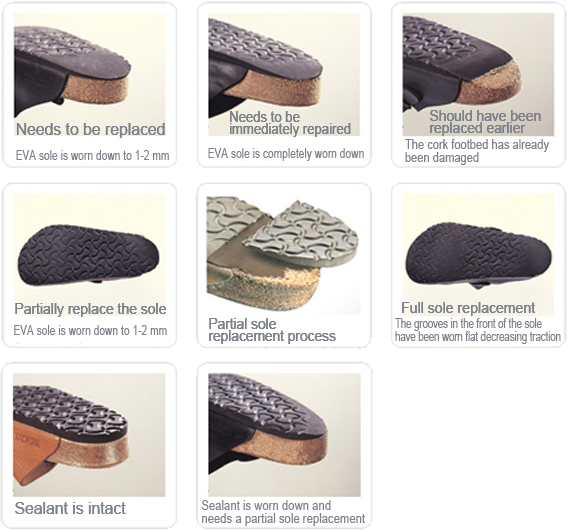 Should the EVA sole be worn out by more than three quarters, it is harder to keep you body balanced. Please return your Birkenstocks to your local shop to replace worn sole. If the wear on the sole continues until the cork footbed is damaged, please return your shoes for immediate repair otherwise greater damage to the cork footbed will increase repair costs and time. If the grooves in your shoe’s EVA soles have been worn away you may need to replace the entire sole. Birkenstocks come with a light coating of glossy cork sealant on the exposed cork edge. This coat of sealant will be damaged by the friction from use which causes the cork to dry. When the cork no longer looks shiny, you can purchase Birkenstock Cork Life® and apply a thin coat to the exposed cork at home yourself or return your shoes to your local shop.